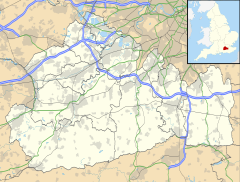 Ockham /ˈɒkəm/ is a rural and semi-rural village in the borough of Guildford in Surrey, England. The village starts immediately east of the A3 but the lands extend to the River Wey in the west where it has a large mill-house. Ockham is between Cobham (near Leatherhead) and East Horsley (near Guildford). The Semaphore Tower rises from high Ockham and Wisley Commons at Chatley Heath. These are separated from the formal landscape of Painshill Park by the M25 motorway. All Saints (in the Church of England). Most of the Grade I architecturally listed church (in different sections) spans the middle of the Middle Ages. Ockham Mill one of a cluster of three buildings close to Wisley. Ockham has been occupied since at least the middle bronze age (c.1500-1100 BC), evidenced by the so-called 'Ockham Hoard'. a collection of bronze-age objects discovered in 2013 during building works at the former Hautboy Inn., as well as the existence of a, relatively uncommon, bell barrow on Cockcrow Hill. Ockham appears in Domesday Book of 1086 as Bocheham. Held by Richard Fitz Gilbert, its domesday assets were: 1½ hides, 1 church, 2 fisheries worth 10d, 3 ploughs, 2 acres (0.81 ha) of meadow, woodland worth 60 hogs. It rendered £10 per year to its overlords. All Saints Church is a Grade I listed building. The foundations were laid in the 12th century, and part of the nave was built then. The chancel and north aisle date from the 13th century, the south nave wall from the 14th century, and the tower and north aisle wall from the 15th century. A small chapel (north wing) was finished in 1735. The whole building was restored and the aisle was extended in 1875. Through the Middle Ages in the many records nationally (such as Assize Rolls and feet of fines), Ockham features no high nobles among its owners. However it is the birthplace of William of Ockham the famous mediaeval philosopher and the proponent of Occam's razor. Byron's daughter, Ada Lovelace, lived briefly at Ockham Park before settling at Horsley Towers, which her husband the 1st Earl of Lovelace built in the village of East Horsley. His forefather Sir Peter King bought the manor using an Act of Parliament to cement the deal from the long-standing lords of the manor the Weston family of Albury, Send in Surrey, and of Sussex, who had acquired the manor from distant cousins who since their late Tudor period forebear, Francis Weston, owned it along with Sutton Place, Surrey in the extreme south of the parish of Woking. An act of charity in the village assisted one family in the 'Underground Railroad' in the US that resulted from the Fugitive Slave Act of 1850. After reaching Liverpool in 1850, following an arduous journey starting with a flight to freedom from Macon, Georgia, African-American slaves William and Ellen Craft were given a home by a parishioner in Ockham in 1851. They attended the Ockham School, and paid for their education by working as teachers: William giving instruction in carpentry, and Ellen in sewing. In 1852 their first child, Charles Estlin Phillips Craft, was born in Ockham. One year later, they left Ockham and returned to London. In 1871, they started the Woodville Co-Operative Farm School, modelled after the Ockham School. The soil of Ockham Common varies between fertile light clay and humus topsoil to highly acidic, sandy heath. In the north is the high, uneroded Bagshot Sand. The southern part of the parish is on the London Clay. Part of the Wey Valley in the west of the parish and the banks of a stream which joins it from the east are particularly formed from alluvium. Ockham and Wisley Commons support rare species in their nationally rare soil type, acid, naturally wet sandy heath and bog soil. The tall, narrow Octagonal, inhabitable tower dates to the early 19th century when the Napoleonic Wars were raging. One of the largest formerly industrial millhouses on the Wey, comparable to the converted ones in Old Woking and that of the Surrey Advertiser millhouse in Guildford, Ockham mill is dated 1862 and is a Grade II listed building. It is of four storeys red stock brick with decorative brick and tile bands over each floor. Providing unusual quirkyness, it has brick-dentilled eaves over its third 3 first floor and one of its windows is considered "Lovelace style", i.e. with deeply inlaid recess as in the East Horsley walls of the memorials to the Earl of Lovelace. Ockham Common, to the north-east of the village, is the site of the disused Wisley Airfield, which has a paved 2 km (1.2 mi) runway (RWY 10/28). As late as 1972, this airfield was in service as a satellite fit-out and flight test centre for Vickers and latterly the British Aircraft Corporation, linked to their main factory and airfield at nearby Brooklands, Weybridge, capable of taking aircraft as large as the VC10. Although the airfield is disused, the aviation connection remains: it is the location of OCK, a VOR navigational beacon which anchors the South West (SW) Arrival Stack for London Heathrow Airport (ICAO: EGLL / IATA: LHR), which along with Biggin Hill, Kent (BIG – SE Arrivals), Bovingdon, Hertfordshire (BNN – NW Arrivals) and Lambourne, Essex (LAM – NE Arrivals) are London's main holds. This small linear settlement is a hamlet to the east of the village, near Downside and Cobham. It has the village's only pub; The Black Swan. Ockham has cricket and football clubs that play at weekends at Hautboy Meadows on Ockham Lane. The cricket club has two teams in the Surrey Downs League and a Sunday friendly (matches) only side. The football club are in the Guildford & Woking Alliance. The village gave its name to HMS Ockham, a Ham class minesweeper. ^ a b c d "Ockham (Parish): Key Figures for 2011 Census". Neighbourhood Statistics. Office for National Statistics. Retrieved 21 November 2013. ^ Old claims that he was born in a hamlet of Ockham in Yorkshire have since before 1997 been countered by a mass of more local records indicating that his birthplace was in Surrey. See Wood, Rega (1997). Ockham on the Virtues. Purdue University Press. pp. 3, 6–7n1. ISBN 978-1-55753-097-4. ^ Historic England. "Millstream House, Ockham Mill (1188416)". National Heritage List for England. Retrieved 31 December 2018. The Oak Hamlet: Being an Account of the History and Associations of the Village of Ockham, Surrey by Henry Saint John Hick Bashall (London: Elliot Stock; 1900). OCLC 23371038. Wikimedia Commons has media related to Ockham, Surrey.